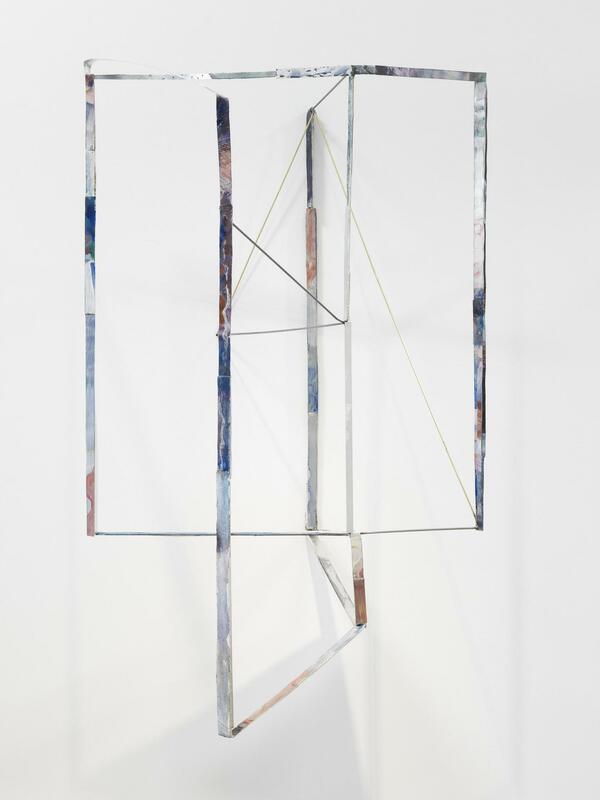 The things that Sara Barker makes are less like sculptures than spatial drawings. Maybe, in fact, they’re not so much drawings as paintings – surfaces for colour and brush-marks, scraps of collage and daubs of textured filler. Then again, in their emphatically three-dimensional assumption of volume, perhaps they really are more like sculptures than paintings. Barker’s art is evasive, and deliberately so. When her spindly, tensile constructions come to resemble three-dimensional floorplans (as they do in works such as phloem, 2011, or story of a house, 2012) Barker invariably weaves some kink into her architecture, a geometric dogleg that seems designed to shake off the viewer as we follow her lines through space. She complicates classically balanced rectangles with extra corners, or pulls lines out of the grid to hang limply on the floor. For Barker, an artwork is a space that she, the artist, can inhabit. One line demarcates a threshold, four lines an enclosure. Add another four, or eight, and that rectangle becomes a room, a vessel for atmosphere, memory and imagination. (The mind will only wander after it recognises the limits of its surroundings.) By paring down these schematised spaces to vectors and the slimmest of painterly surfaces, Barker prepares an open but fertile ground on which to seed colour, texture, pattern, and a palette of intimate references and associations known only to herself. She has long been interested in the motif of the room in Modernist literature. For many female writers, most famously Virginia Woolf but also May Sarton and Doris Lessing, architecture (spaces built and controlled, historically, by men) stood for confines to be transcended, or a barren scaffold to be dressed by one’s taste and aesthetic sensibility. Decoration and daydreaming can equally be acts of defiance. Barker’s structures take inspiration from the preciousness of private, interior spaces just as they acknowledge the power of their external expressions. In story of a house, she applied paint to aluminium surfaces then sliced them up; the resultant slivers of colour are like glimpses caught through the door of Barker’s studio. In that private workspace, ideas, references, snatches of music and images are allowed to float and sometimes stick to one or other of her artworks. For an exhibition titled ‘hanging a way of dressing’, in 2008, she applied a blue colour to her sculptures that evoked, to her, a particular description of the sea in a poem by Yiannis Ritsos; for a year, that was the only colour she used, imbuing metal and cardboard struts with a weightlessness that worked against their inherent materiality. That Barker sees colour as structural, with its own strength and density, is typical of her conflation of image and object, surface and support. Windows and doors, opposing models for the ontological status of painting pre- and post-Modernism, recur in her sculptures not as pictorial ciphers but as motifs of architectural possibility. They are entrances and exits, framing devices for views and voids. Architecture is, by its nature, mostly rigid and immobile. Many of Barker’s sculptures, however, seem to be melting into other forms, flexing under their own weight, or threatening to peel apart. Taking its title from a novel by Magdalena Tulli, her presentation for Liste 17 is called ‘Moving Parts’. In this respect, her forms share more with bodies than with architectural spaces. (There are very few true right angles in Barker’s work.) Indeed, Barker has described how, when constructing an object, she knows it is finished when it takes on an autonomous physical presence comparable to, or exceeding, her own. 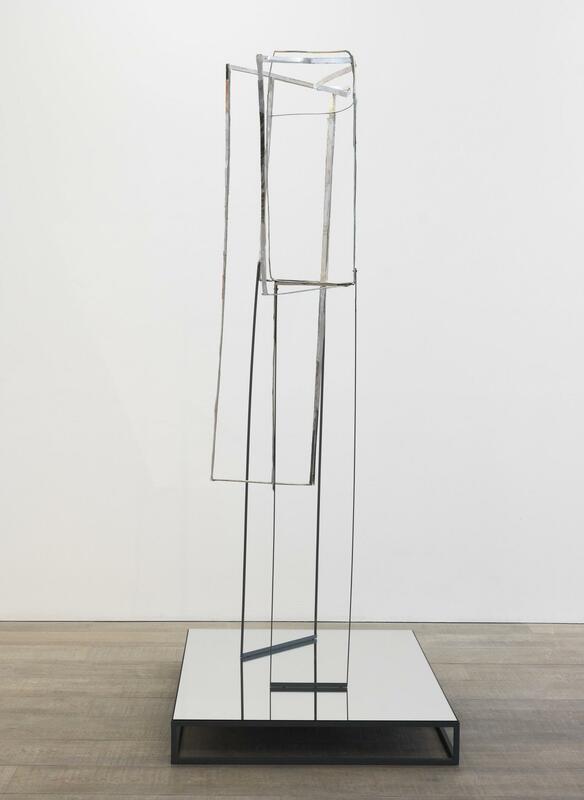 In some works, particularly those that stand on or otherwise touch the floor, bodies are explicitly evoked; tact – text (2012) and He (2011) are good examples of sculptures that seem to confront the viewer, looking back rather than waiting to be looked at or through. A sculpture such as washable colour (2012) complicates this opposition. While rectangular forms, fixed to the wall, imply windows or door frames, a confluence of arcing lines that emerges from the wall and rests, squarely, on the floor resembles a figure – even, specifically, a female figure. Looking at it, I am reminded of Caspar David Friedrich’s painting Woman at a Window (1822) – itself a half-occluded view within a view. The truth is that it has never occurred to Barker to make this distinction between space and figure. In her work, architectural space is not solely an external phenomenon, nor is interior, psychological experience confined by the limits of one’s body. (Freud wrote extensively on how rooms, doors and wardrobes in his his patients’ dreams symbolised the female anatomy.) For an artist such as Barker, who relies on her unconscious to guide her material, tonal and structural decisions, it is vital that these demarcations remain porous. That is not to say that Barker does not hold plenty back from the viewer, or that there is not an unassailable sense of privacy within her practice. It is in this regard that it claims its power, its autonomy. Her recent inclusion of mirrors and panes of glass in her work is emblematic of this desire to withhold entry, or to make the viewer all the more conscious of occupying what Barker calls ‘pockets of space’ in order to encounter her softly-spoken inventions. Even at close-hand they keep their distance.